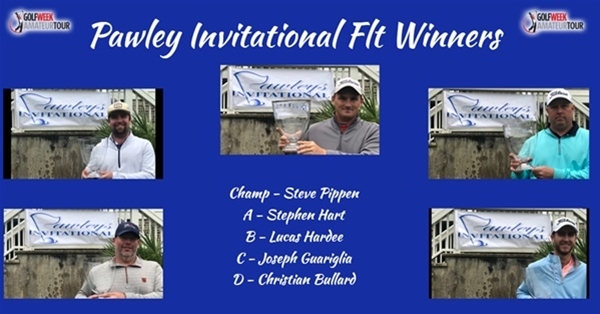 The Charleston, Myrtle Beach and Eastern Carolina tours all gathered on Pawley’s Island Feb 15 through the 17th for our annual Pawley’s Invitational. This year we were joined by players from over 12 different tours and had a field of 124 players. The weather outside of a rain delay on Sat morning, cooperated and there was some spectacular golf played. In the Championship Flight, Phil Pfeiffer and Bill Jenner seemed to be fighting it out for the Championship. Stephen Pippin in the group in front would have none of that as he posted a two under 70 on day 2 and watched as Bill and Phil tried to birdie eighteen for a tie. Congrats Stephen as his 144 total was one better than Phil on this weekend. The A flight had some great play as well as Fred Dixon and Patrick Gamblin both posted rounds of even par on day one with Stephen hart one shot back at 73. Although Fred played another very good round on day two, Stephen Hart stole the show with a 3 under 69 for a two shot victory. Patrick held on to edge out Jason Dores and Donnie Pritt by a single shot for third place. The B flight continued the trend of good golf as Lucas Hardee fired a first round 74 to take the lead heading into the second day. Lucas could not cruise as there were ten golfers within 7 shots of his lead. Good thing he did as Billy Gamblin fired a final round 78 which included birding 17 and 18 to get within a shot of Lucas. Jace Gause took third place with rounds of 79-80 while Jerry mast and John sager were one and two shots in back of him. The C flight saw a come from behind victory as Joey Guariglia came back from a four shot deficit to post a three shot victory. Travis Carlisle had the day one lead with a very smooth 81 followed by T.J. Eaves who finished one shot back on day one. Joey and Shane Grainger were then both in third with solid 85’s. The second day joey posted a very nice round of 81 for his three shot victory. The D flight had Christian Bullard edging out mike Flannigan by three shots with a two day total of 187 (97-90) to Mike’s 190. John Davis, Julie Johnson and Mike Marino all posted two day totals of 191 for a three way tie for third place.